INCLUDES OPTIONAL ROUND-TRIP TRANSPORTATION FROM FLAGSTAFF, ARIZ.
INCLUDES OPTIONAL RETURN TRANSPORTATION TO SOUTH RIM OF GRAND CANYON OR FLAGSTAFF, ARIZ. The 8 Day Oar with Hike In is for those seeking maximum adventure. 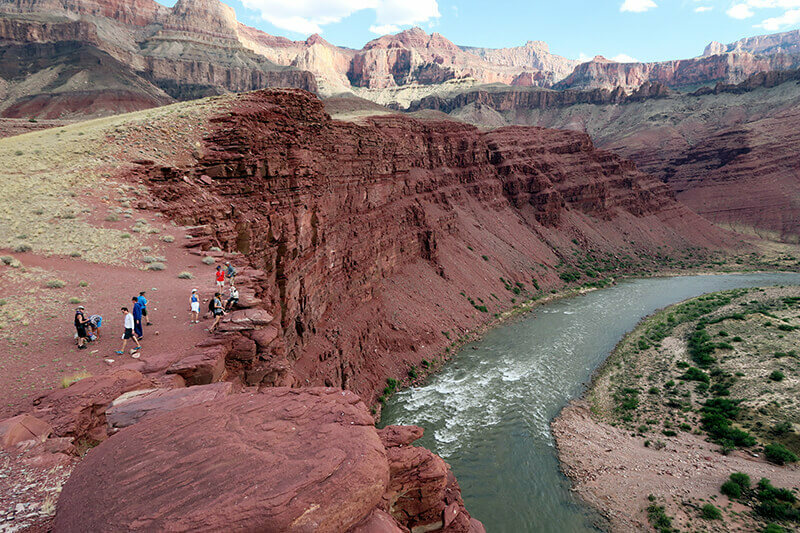 This Grand Canyon rafting trip begins with an 8-mile hike from the South Rim down to the Colorado River at river mile 89, where you’ll jump right into rafting 136 rapid-filled river miles. Along the way to Diamond Creek, you will camp along the river’s edge and have time to explore the many side canyon trails and waterfalls. Return to South Rim at the end of the trip is included. Download the Trip Info Packet. 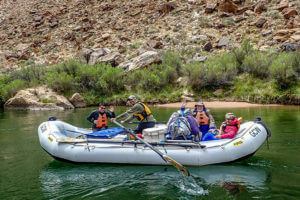 The Hiker’s Special 9 Day Oar with Hike In is offered only twice a year and is for those wanting to do a lot of hiking during their rafting adventure. The trip begins with an 8-mile hike into the Grand Canyon from the South Rim down to the Colorado River at river mile 89. From there, you jump right into rafting 136 rapid-filled river miles, camping along sandy beaches each night, all the way to Diamond Creek. This trip gives you more time to explore the many side canyons and waterfalls just a quick hike away from the river’s edge. You will be returned to either South Rim or Flagstaff, AZ at the end of the trip. The Hiker’s Special 7 Day Oar with Hike Out is only run twice a year and is made for hiking enthusiasts. 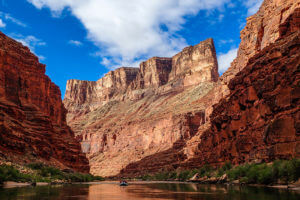 This rafting trip embarks from Lees Ferry and continues through the stunning rock formations of Marble Canyon, camping each night on sandy beaches, on to river mile 89. 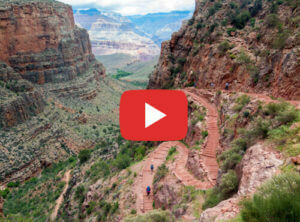 On the seventh day, you begin your tough 8-mile hike from the river to South Rim. Our included transportation package makes this an easy round trip from Flagstaff, AZ. 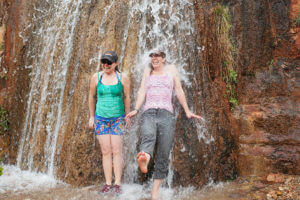 The Hiker’s Special 7 Day Motor with Hike In is offered only once a year and is for those wanting to do a lot of hiking during their rafting adventure. 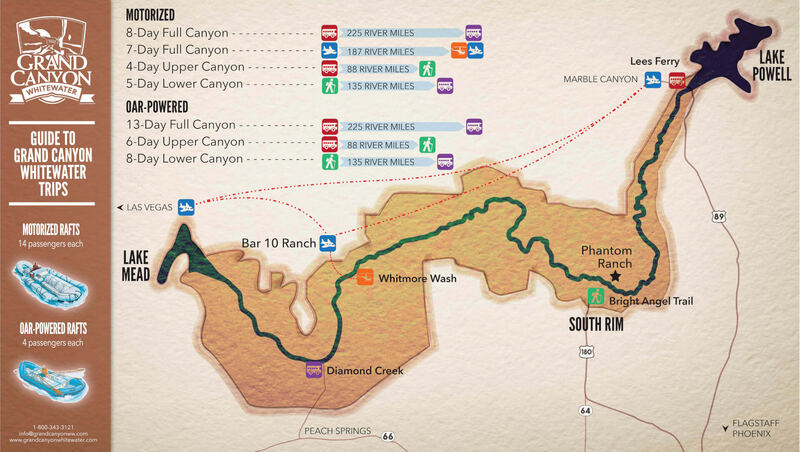 The trip begins with a tough 8-mile hike into the Grand Canyon from the South Rim down to river mile 89. From there, you will jump right into rafting 136 rapid-filled river miles to Diamond Creek. This trip gives you more time to explore the many side canyon trails and waterfalls, and to camp along the river’s edge each night. The transportation package included returns you to the South Rim or to Flagstaff, AZ at the end of your Grand Canyon adventure. Where GCW river rafting trips start and end. 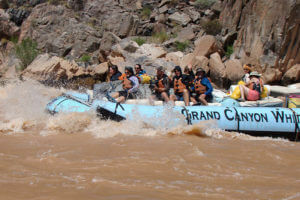 Grand Canyon Whitewater rafting trips give you the opportunity to be in one of the most spectacular places on earth, and to truly get to know the Grand Canyon and the Colorado River. 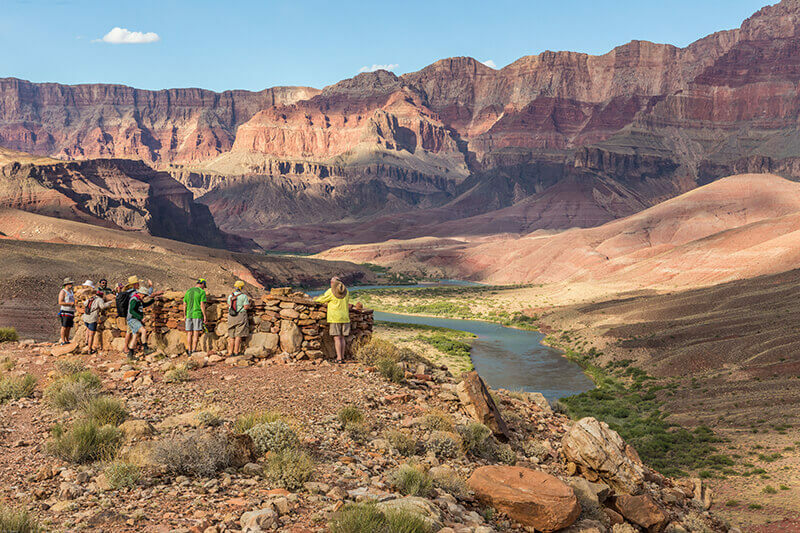 On our excursions, you will raft world-class whitewater, camp on sandy Grand Canyon beaches each night, explore winding side canyon trails and waterfalls and view ancient ruins. 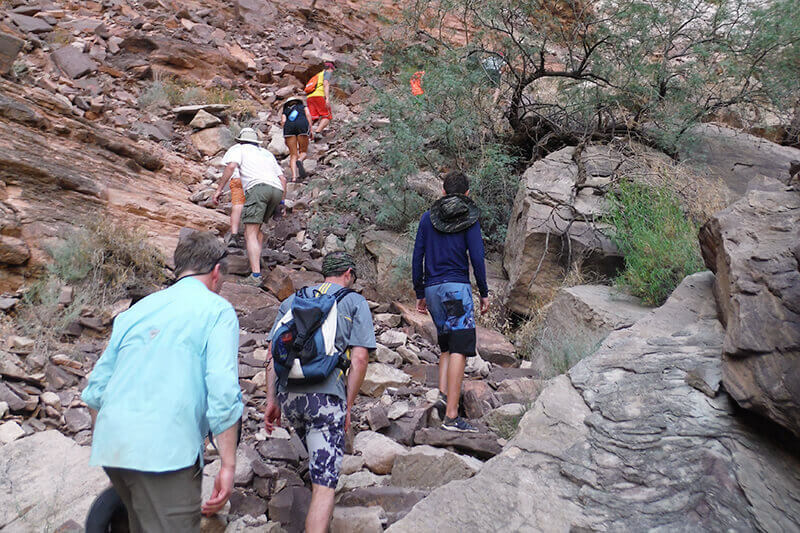 Are you interested in a trip with a Hike In or Hike Out of Grand Canyon? If so, are you physically capable? What kind of raft are you interested in? Motor or Oar-Powered? Call us at 800-343-3121 for more details on our Grand Canyon rafting trips or book online now. Also, make sure to check out our YouTube page with a ton of informative videos. Our rafting season runs from April to October and any time is a good time to go rafting! Because trips book up well in advance, flexibility in your time frame can be beneficial. If you are looking for milder weather, book a trip in April, May, early June, September or October. If your availability is in the peak summer months, during our monsoon season, expect to see some dramatic desert thunderheads, which can help make those high temps feel less extreme. Because the Colorado River flowing through Grand Canyon is controlled by Glen Canyon Dam, water levels are fairly consistent, providing great whitewater throughout our entire season. Keep in mind that Arizona typically has very low humidity and a dry heat, so higher temperatures are often welcomed to balance the cold splashes of river water! There is one weather station at river level, be sure to check the weather before your trip. Consider the amount of time you have for your adventure of a lifetime. The Full Canyon experience can be had in a minimum of 7 days in a motorized raft or can last up to 15 days in an oar-powered raft. We would always recommend spending as much time as you can in the canyon. If you don’t have a week or two, we have some shorter trip options. However, the shorter trips include a mandatory hike in or out of the canyon. 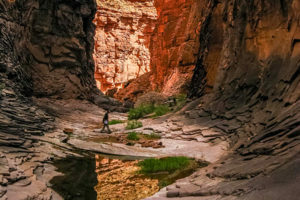 If you choose to participate in a Partial Canyon trip, you need to really give some thought to the strenuous 8-mile hike in or out of the Grand Canyon. See the following section about the Hike In or Out. 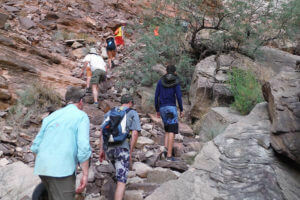 Are you interested in a trip with a Hike In or Out of Grand Canyon? If so, are you physically capable? These trips are great, double-bucket-list for hiking enthusiasts who love a challenge. If you’ve always wanted to raft and hike Grand Canyon, this is the trip for you. We encourage you to watch the video (on right) to give you an idea of what to expect on the mandatory hike these trips require. Because the hike is strenuous, we require interested folks to call us and talk to us about their hiking experience, current exercise routine, training plan and medical history before booking. 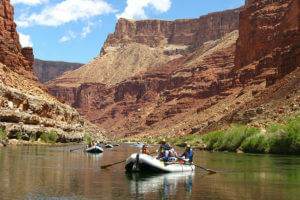 GCW offers both motorized and oar-powered Grand Canyon river trips. Our most popular trips are aboard motorized rafts. For those of you who have more time and are looking for a more leisurely pace, oar-powered rafts are a great choice. 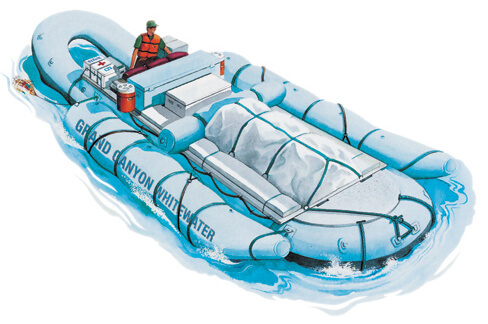 Both motorized rafts and oar-powered rafts are made of rubber and designed specifically for whitewater rafting. Motorized rafts are 35 feet long and hold about 14 passengers and a guide who drives the boat from the back (or stern). A benefit to the motorized rafts is they allow people to see more of the Canyon because they can go about twice the speed of the current. We aren’t talking major speed here; the current averages about 4 miles per hour, so we cruise along at 8 miles per hour. The motor boats give passengers a fun and exciting ride. Rafters are seated on padded bench seats along each side of the raft facing the canyon walls. Your feet will be slightly up on the side pontoons with a duffel pile to lean back against. 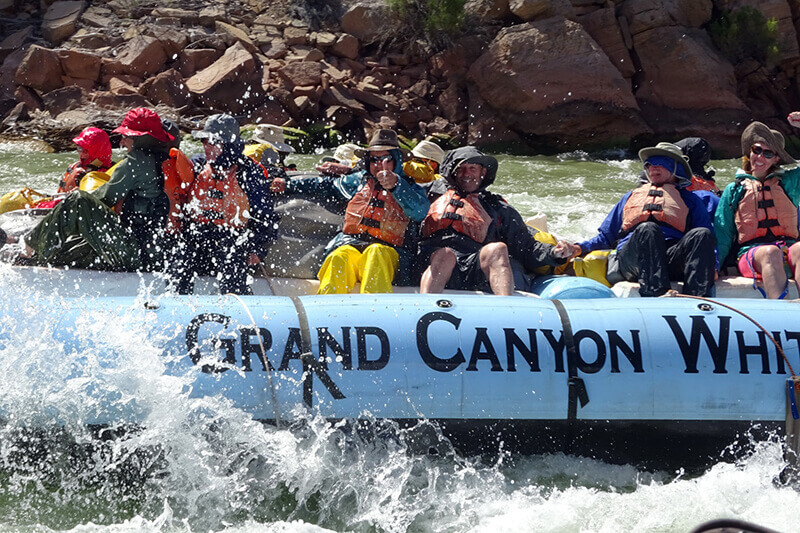 We’ve been told that our motorized rafts are some of the most comfortable in Grand Canyon. Lay back and take in the breathtaking view or close your eyes for a nap while coasting the flat water. If you choose to sit near the front you’ll be right in the action or move towards the back to dry off. Feel free to rotate seat positions and take turns up front. 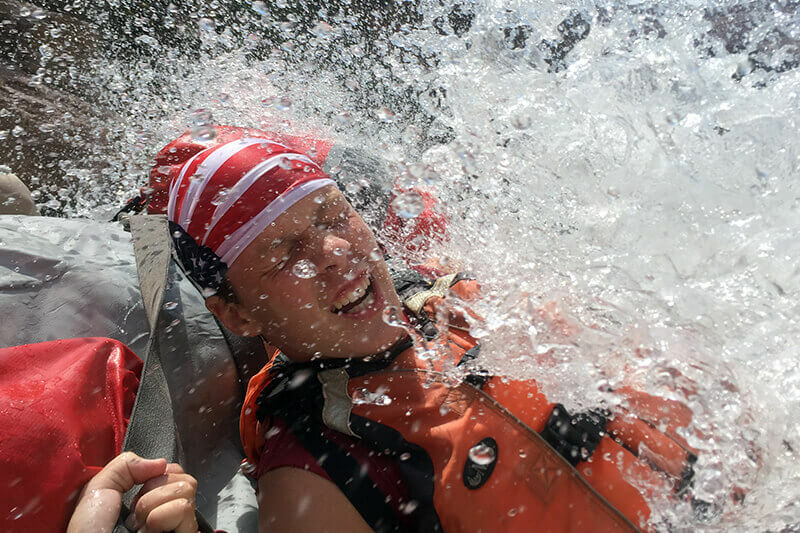 We also highly recommend switching rafts throughout the trip so you can experience the different guides’ interpretative styles and personalities. Passengers must be at least 8 years old to participate in motorized raft trips. Oar-powered rafts are 18 feet long and carry 4-5 passengers and one guide to row the raft. The guide sits in the middle and has two long oars to maneuver the raft down the river and through the rapids. The raft will float along at the speed of the current, about 4 miles per hour. 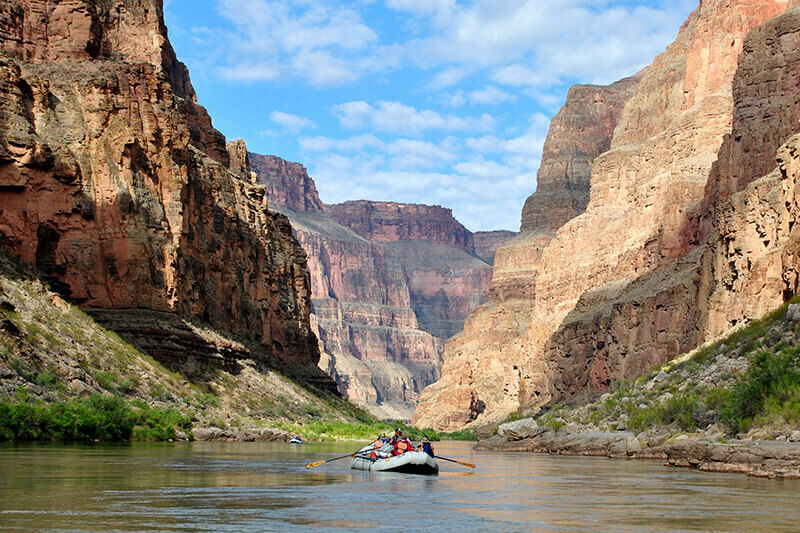 For this reason, oar-powered trips are typically longer, unless you choose to do only half of the trip and either hike into or out of the Grand Canyon. The benefit of an oar trip is you’ll have ample time with your guide to chat, hear stories about historic river runners, ask geology questions, and listen to in-depth interpretation of the Grand Canyon. This is NOT a paddle trip. The guides are the ones doing the rowing – guests will not be issued a paddle or an oar. As a passenger, your job is to hang on, enjoy the ride and take in the beauty of Grand Canyon. 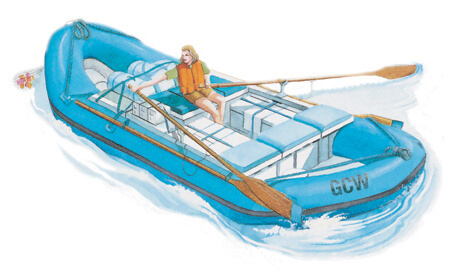 Passengers must be at least 12 years old to participate in GCW’s oar-powered trips. Have more questions about whitewater rafting the Colorado River and which trip to select? Check out our FAQs, give our office a call at 800-343-3121 or take our quick quiz to help you pick the perfect trip. Our office staff members, pictured below, are all very knowledgeable about rafting trips in Grand Canyon. We would love to help you discover which rafting adventure is right for you. As an Arizona native, I’ve been lucky to experience Grand Canyon by foot, air and now by river. Flagstaff instantly felt like home since attending college at Northern Arizona University in 2009. Soon after, raising my two daughters became my full focus. As grateful as I am for that time at home, I am now just as excited to be a part of the river community. My favorite part of river life is the involuntary chance to unwind. The thrill of the rapids and the stillness under the night stars has left me with a new sentimentality for life. 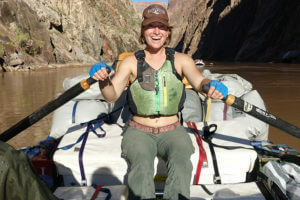 I am happy to answer any questions you may have about your Grand Canyon Whitewater trip! I went on my first Grand Canyon river trip in 2015 and have been hooked since. There is nothing like floating down the mighty Colorado river watching the Canyon change before your eyes. I started my career as a photojournalist for the Arizona Daily Star and was lucky enough to photograph everything from presidents to national championship football games. In 2006, I did my first grand adventure when I rode my bicycle from Eugene, Oregon to San Francisco covering 700 miles over two weeks. I was also lucky enough to do the same in the Midwest, riding 500 miles from Denver to my hometown of Grand Island, Nebraska (although that was all downhill!). The time I’ve spent in the Grand Canyon has been magical; I can’t wait to help you with your Grand Canyon Whitewater experience. I’m Lindsay and I work as a reservation agent and marketing director for Grand Canyon Whitewater. I am lucky to have grown up around the Grand Canyon rafting community. My father was introduced to the Colorado River by my grandmother, who took the family on a Grand Canyon trip in the early days of river running, and became a river guide in the 70s. My mother adventurously participated as a passenger on a river trip in the ’70s when she met and fell in love with my father, the river guide; they began running the river together, were soon married and had my sister and me. My sister worked as a river guide in the Grand Canyon and met her husband in the Canyon as well! My dad took me on my first Colorado River trip in 1993 and I have been down there every summer since! To me, the Grand Canyon brings about a realness, simplicity and calm that I don’t get anywhere else. It really is a magical place and I feel lucky to have the opportunity to experience it. When I’m not in the office or the Canyon, you can find me hiking near my Arizona home or venturing off into Spanish-speaking places learning the language and culture, Guatemala being one of my favorites! I have worked on the river in Grand Canyon and in the office and am always happy to help people with any questions they may have about Colorado River rafting! 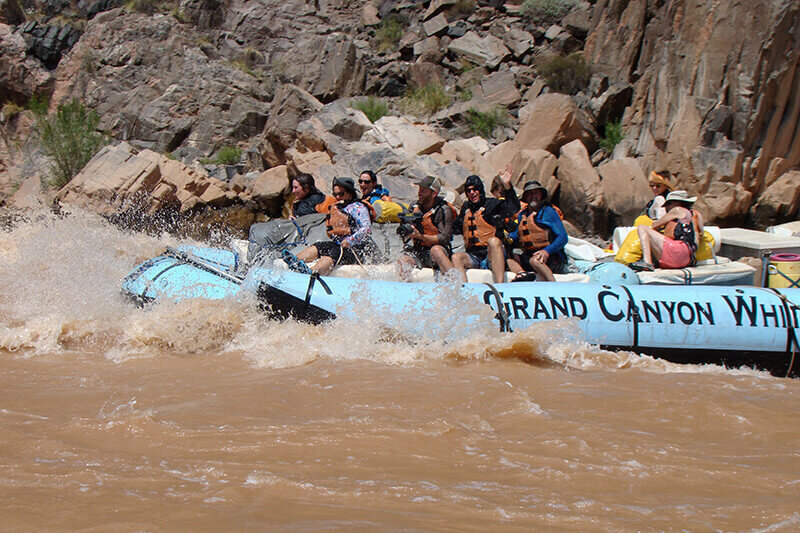 To book your Grand Canyon Whitewater rafting adventure, you can call us to check availability at 800-343-3121 or book online above. $400 deposit per person is required at time of booking. Balance is due 120 days days prior to trip departure. We accept checks, Visa, MasterCard or Discover. If you are sending in a check or need time to work on other logistics, we can put a temporary hold on your reservation.